I have enjoyed hunting with a bow most of my adult life. I don’t get out as much as I did when I was younger, but still like toting the bow around in the woods when I get a chance. Most of the people I run into think you need to spend big money to get into bow hunting when that just isn’t true. If you are patient, take your time and look around you will be able to set yourself up for under $100 easy. You purchase could even double up as a survivalist bow. From small game to bears, just about every game animal on this continent can be taken with a bow. If you are adding another layer to your preps or just want a new challenge in taking down a deer, bow hunting will fit the bill. When you decide to take the plunge into the world of archery you will be faced with a decision right at the start. 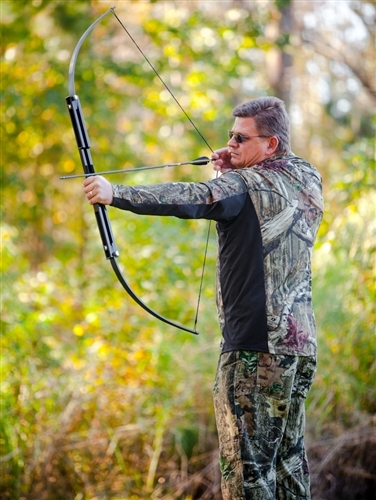 Do you want to shoot a modern compound bow, or go the old traditional way of the recurve and longbow? Each type has its own advantages. Both can be found cheaply and both will cleanly take game for the archer who has put in the time to become somewhat proficient. 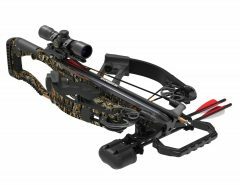 The compound holds the edge in performance, and will deliver an arrow faster and at a flatter trajectory. However they tend to be louder on the release, weigh considerably more, (ask me about lugging my compound around the Colorado Rockies for years) and they are somewhat limited in being able to produce your own equipment. 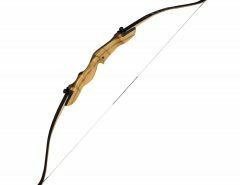 On the other hand a traditional bow will allow you to shoot a heavier wooden arrow that will deliver more energy down range to the target. 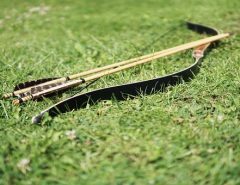 (Don’t shoot wooden arrows from a compound since they can splinter and skewer your arm under the high stress of those bows) The traditional bow is much lighter, which you will appreciate after tramping over mountains all day. A real plus on their side is that you can craft them yourself. Native Americans created bows from local wood in all parts of North America, and you can do the same with a little research and some gumption. My go-to place for picking up cheap functional bows has been ebay. You will need to be patient and know what you are looking for, but something inexpensive will usually show up within a week. 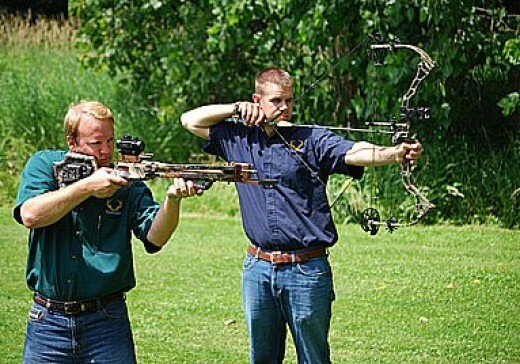 Ebay is a little tricky for archery since they have two categories…Archery, and Bow Hunting…make sure you check both. Always be sure to watch the shipping prices because some otherwise good deals are ruined by high shipping costs, maybe you will get lucky and bid on something local. Always look closely at the description and the pictures to check the condition and be sure to ask any questions. I have bought most of my bows here but I also check yard sales, auctions, pawn shops and craigslist when I am in the market for something or just digging around for a deal. I admit getting up in years I don’t like change much. I learned to shoot with wooden arrows, graduated to aluminum arrows when I was a compound shooter and now I am mostly back to wooden arrows with my recurves. I have a dozen or so carbon arrows but just don’t see the point when I have a bunch of old wooden ones that work just fine. Shop around ebay for arrows being sold in lots. 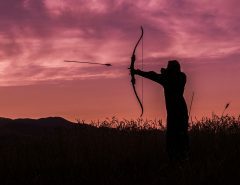 You might have to do some refletching but you will learn about your arrows in the process and develop a bond with each one as you personally make it yours. Again Ebay is the way to got. You will find used accessories sold in lots that will set you up. You should keep your eye out for junk bows being sold, online or otherwise. I picked up a bow at an auction for $5. It was a Bear compound probably 10+ years old that looked like it had been left out in the woods for a few years. The plastic is coming off of the cables and one of the pulleys is broken. The reason I bought it is that it had bolted on a Bear removable quiver, and set of bear pin sights and a short field stabilizer, all in good shape. As you can see deals are where you can find them, even on junk bows. After a while bow hunting becomes and art and whichever route you take it is an enjoyable hobby that can put food on your table.